Penetration of the blood brain barrier (BBB) by appropriate fluorescent probes remains a challenge in optical imaging and diagnostics. We designed, synthesized and observed the in vivo BBB penetration of a LASER syn-bimane probe. 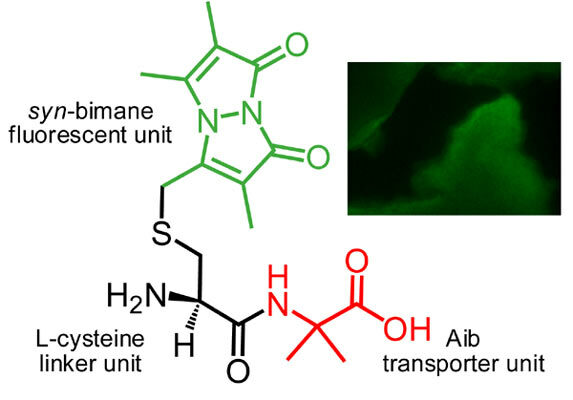 Results demonstrate that the Aib transporter unit in our probe may lead a fluorescent bimanyl moiety across the BBB. Blood-brain barrier, fluorescence microscopy, fluorescent probe, LASER dye, syn-bimane. Department of Biological Chemistry, Ariel University, Ariel 40700, Israel.